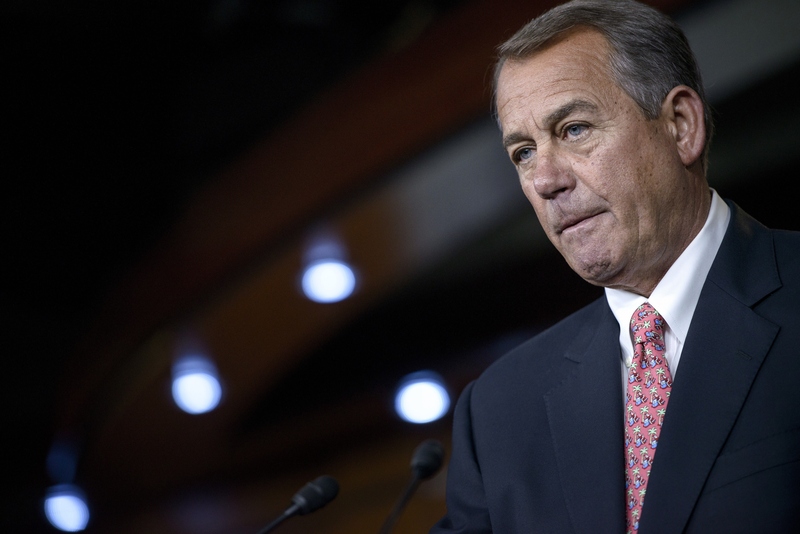 Is John Boehner's re-election as House speaker in jeopardy? With just two days until the House will elect their next leader, the man who holds the post, Rep. John Boehner, R-Ohio, has found he has a little competition. Boehner had been cruising toward a drama-free re-election this Tuesday after successfully winning re-election among his Republican colleagues in November. But over the weekend, a handful of conservative members of the House announced they would not support Boehner, and Reps. Ted Yoho, R-Florida, and Louie Gohmert, R-Texas, have said they might make a run to unseat Boehner. The lame-duck session of Congress didn't sit well with several members who objected to the $1.1 trillion spending bill (also known as the "CRomnibus") that squeaked through Congress during December, averting a potential government shutdown. "Republicans gave away the best tool available to rein in our liberal activist President: the power of the purse," said Rep. Jim Bridenstine, R-Oklahoma, last Friday, the first member to announce he would not be voting to re-elect Boehner. Bridenstine called the measure a failure because it did not defund President Obama's Affordable Care Act or try to block him from deferring deportation for millions of illegal immigrants. Reps. Thomas Massie, R-Kentucky, and Ted Yoho, R-Florida, followed with their own announcements that Boehner had lost their votes for speaker. Massie also pointed to the spending bill, which he said the GOP leadersip introduced at the last minute as a way to coerce members to vote for it. Yoho wrote on Facebook Saturday night that there needed to be a change in leadership, though he was otherwise less critical of Boehner. In a follow up statement, Yoho said that "if needed" he would be willing to run to give members another option for leadership. "This is not a personal attack against Mr. Boehner, however, the people desire and deserve a choice. In November, they resoundingly rejected the status quo," he said. But it was Gohmert who said he would definitely challenge Boehner, first saying on "Fox and Friends" Sunday that "a lot of Republicans" had told him they would vote for a Boehner alternative. Later, he released a statement announcing his own candidacy. "There have been numerous examples of problematic Republican leadership, but we were hopeful our leaders got the voters' message. However, after our Speaker forced through the CRomnibus by passing it with Democratic votes and without time to read it, it seemed clear that we needed new leadership," Gohmert said. Though he applauded Yoho for putting his name forward, Gohmert said he had also been encouraged to run by friends and supporters. By Sunday afternoon, Bridenstine's political organization, Friends of Jim Bridenstine, had established gohmertforspeaker.com in support of Gohmert's candidacy. It bears endorsements from both Bridenstine and Massie. Boehner's office has responded coolly to the challenge. "Rep. Boehner was selected as the House Republican Conference's choice for Speaker in November, and he expects to be elected by the whole House next week," spokesman Michael Steel said. A Republican strategist and former top congressional aide, John Feehery, also predicted the opposition "won't amount to a hill of beans." "Boehner will be reelected overwhelmingly. There is no precedent in the history of the House of a Speaker's party exceeding expectations in the election and then dumping its Speaker," Feehery told CBS News. "All of these guys who are complaining about Boehner have nothing to lose because the Speaker has made clear there will be no retribution. So, he is giving them a free shot." In all likelihood, Boehner will survive this latest challenge. He faced a similar conservative insurrection in 2013 when morale among the GOP was far lower, fresh off Mr. Obama's re-election. Boehner won his 2013 election for speaker with 220 votes, six more than he needed. The next-closest candidate was then-House Majority Leader Eric Cantor, R-Virginia, who received three votes. Each of the conservatives who oppose Boehner this time also opposed him then: Bridenstine and Yoho supported Cantor, Gohmert backed former Rep. Allen West, R-Florida, who had just lost his re-election bid in November, and Massie voted for Rep. Justin Amash, R-Michigan. Two of Boehner's other detractors from that election are no longer in Congress, and a third, Rep. Steve Pearce, R-New Mexico, voted in favor of the spending bill that has caused such discontent. Five lawmakers who didn't back Boehner in 2013 could still vote against him, but the Republican majority also grew by 12 members during the 2014 midterms, giving Boehner a few more potential supporters and some breathing room. That's not to say it will be all smooth sailing ahead for Boehner. Even though he is now working with a Senate Republican majority, there are sure to be showdowns with the president over the next year as conservative members push to repeal the Affordable Care Act, approve construction of the Keystone pipeline, block the president's efforts to limit deportations, and more. Many of those agenda items will prompt presidential vetoes, and Boehner may again find himself searching for ways to convince his conference that the most extreme responses--like shutting down the government--do not necessarily serve the party well in the long run.